November has me in a snow mood, so thought I would spotlight another ski LP from the stash (you may remember this one from last year). Formed in 1962, the Hustlers (Adrian Anderson, Mel Anderson, Jan Camp, and Mike Wuergler) started out as a University of Colorado, Boulder folk quartet. During the ski season the group would perform at resorts "entertaining standing room only crowds from Aspen to Sun Valley"(liner notes). 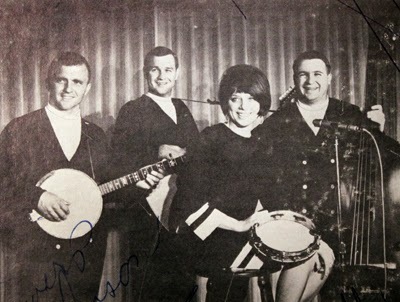 In 1966 the group recorded two LPs on the Morey Bernstein Finer Arts label, The Hustlers Live in Action at the Red Onion (FA 104), and Ski Country (FA 103). That same year the label released two accompanying singles, "The Heart is a Lonely Hunter" / "Julianne" (FA 2011), and "Ski Country" / "The Times I've Had" (FA 2014). Drummer Rod Jenkins also appears on the album (former member of Sunshineward, Nu-Sett, The Contrasts, and The Astronauts). 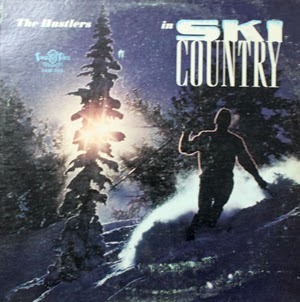 For the purpose of this blog entry, Ski Country features the "clean cut and energetic" sound (as per the liner notes) of the Hustlers. Lots of ski-related offerings, a few covers, and some original ditties thrown in. Mel Anderson (who also produced the LP) moved to Idaho and became the president of the Idaho Potato Commission, where he helped create the popular "Spuddy Buddy" character. Mike Wuergler went into media and was a producer at Walt Disney Productions, was nominated for an Emmy Award, and was the Chief Operating Officer at the American Television Network. Jan Camp Garrett teamed up with singer JD Martin, and the duo continue to perform around the country. Adrian Anderson's whereabouts are unknown.